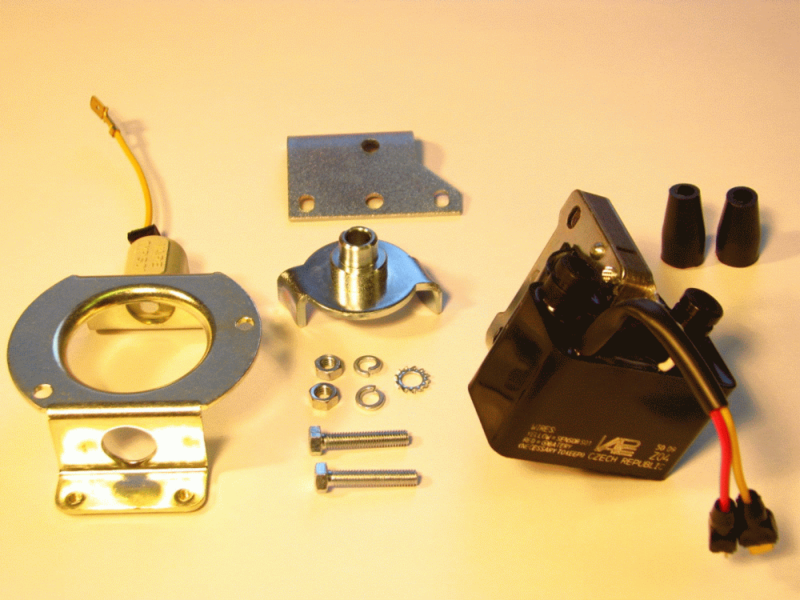 High-speed, left-handed ignition kit without resources. Use for single-cylinder two-stroke engines with a speed range up to 20 000 per minute. The installation of certified engine ČZ125/516. This kit is intended as a replacement for three-phase alternator 12V or 12V single-phase alternator. 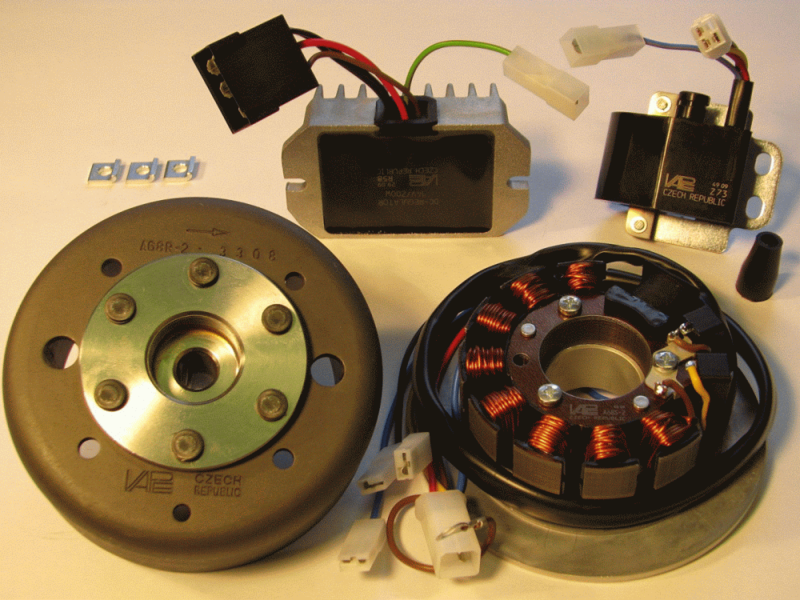 Completely replaces the source and ignition system, including the alternator. They can be used on engines Jawa 350 type 632, 638, 639, 640, and possibly other less common types of which are equipped with any of the above alternators. Be careful when using the type of the 634th Some older models were equipped with 634 6V dynamo, there is possible to use a set Z1-12V or Z2-12V. 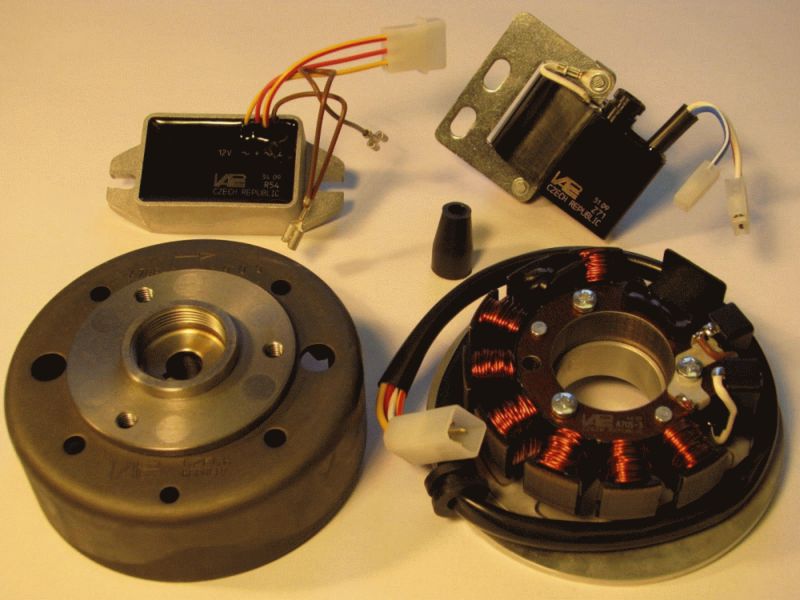 A replacement for the older type contactless ignition alternator does. Motorcycle JAWA type 350 from 634, which have been supplied with a 3 phase alternator. It requires 12V battery. 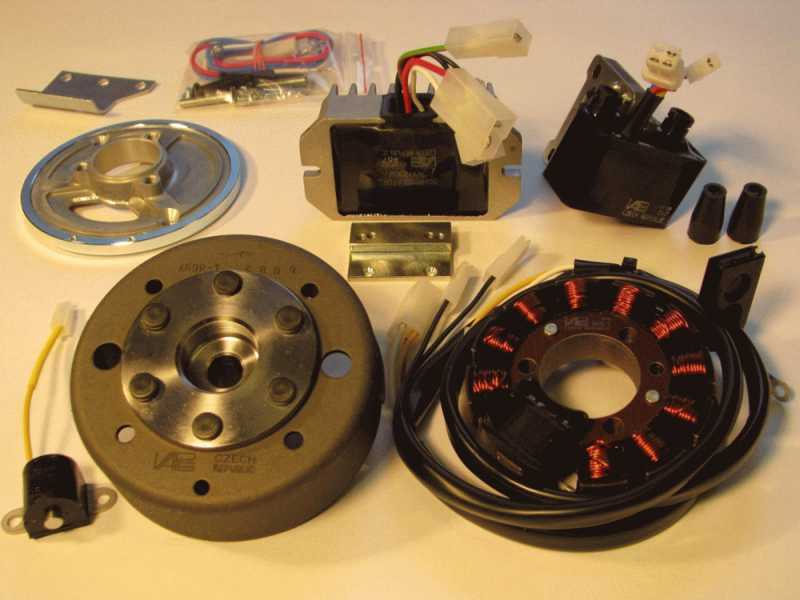 Complete kit for MZ with electronic ignition. 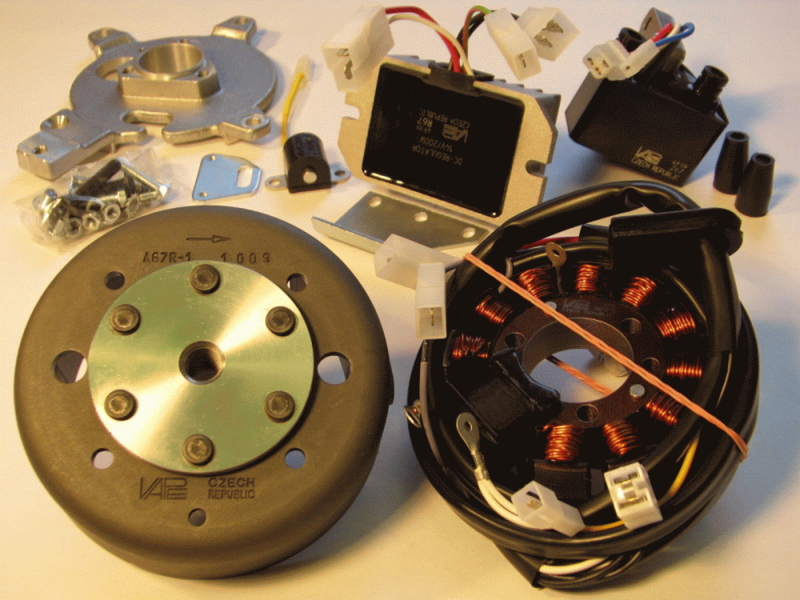 These parts replace all electronic ignitions of MZ to ca. year of construction in 1994 (also ESE and PVL). As a basis an electronic ignition must already exist. For following models applicable: ETZ125, ETZ150, ETZ250, ETZ251, ETZ301. No mechanical changes must be carried out for the rebuilding. The delivery occurs including detailed instructions. The most modern lighting system, make VAPE. Contents: Sensor, rotor finger, ignition coil, clamps, screws, connecting leads, instructions. 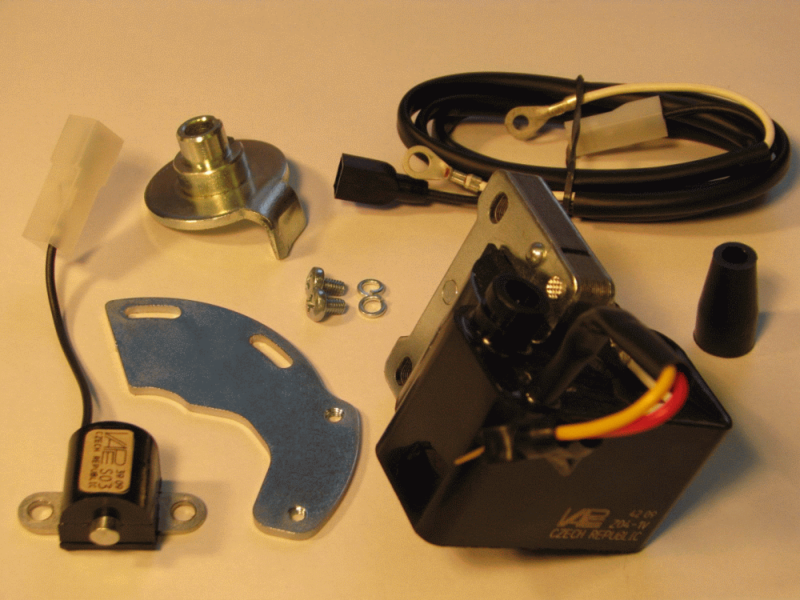 Complete, electronic ignition system 12 V 180 W, suitably for MZ, models ETZ125, ETZ150, ETZ250, ETZ251. This ignition substitutes for the complete generator with unterbreaker or other electronic ignitions. This ignition system is delivered ready with installation and is preset. All ignitions are checked before delivery for effectiveness, all components are tested as a set. To this set we deliver detailed installation instructions with figures. 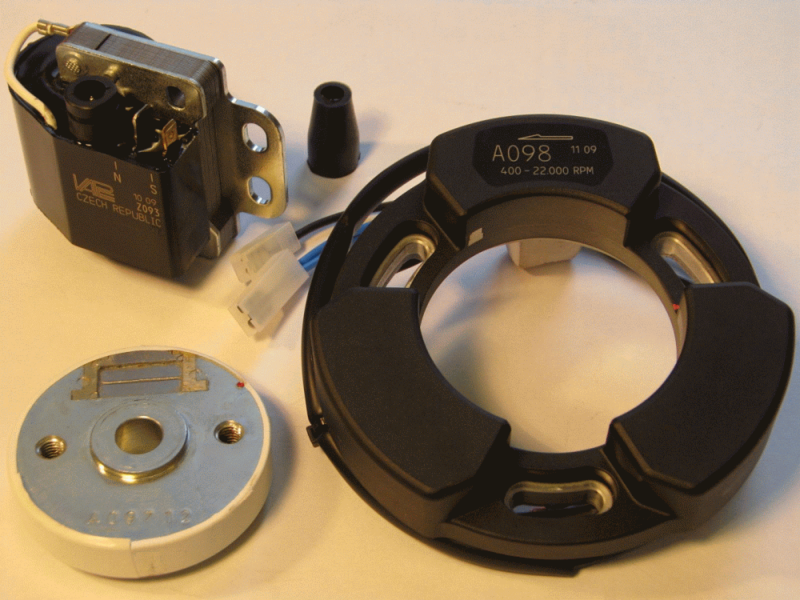 The individual parts of the ignition do not suit for electronic ignitions of other manufacturers. All individual parts are also orderable separately as a spare part with us. In this implementation the ignition system can be operated not without battery. By the complete delivery of the attachment set the ignition is suitably with ETZ125 and ETZ150, but also with ETZ250 and ETZ251. Complete set for all 12V motorcycles Simson 50ccm motorcycles with the year of manufacture 1998 adjustment is necessary cabling. 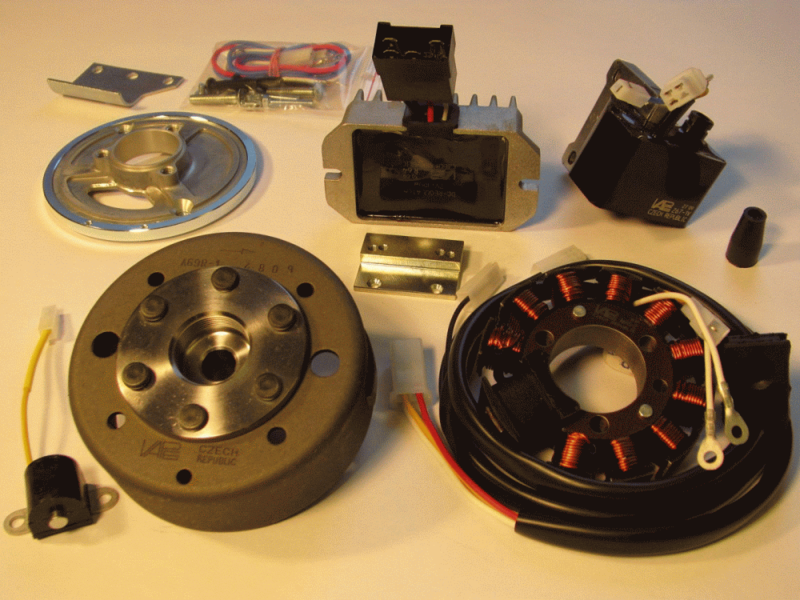 12V source and ignition kit for single-cylinder, two-stroke, clockwise engines. Lamp power 150W. Output at 1 spark plug. Using the Jawa 125 175, 250, types kývačka, Panelka or to other less common types of single-cylinder, including CZ engines that are fitted with 6V dynamo PAL. 12V source and ignition source set, the two-cylinder, two-stroke, clockwise engines. Lamp power 150W. Output at 2 spark plugs. Using the Jawa 350, type kývačka, Panelka or to other less common double cylinder types, including engines CZ, which are fitted with 6V dynamo PAL. 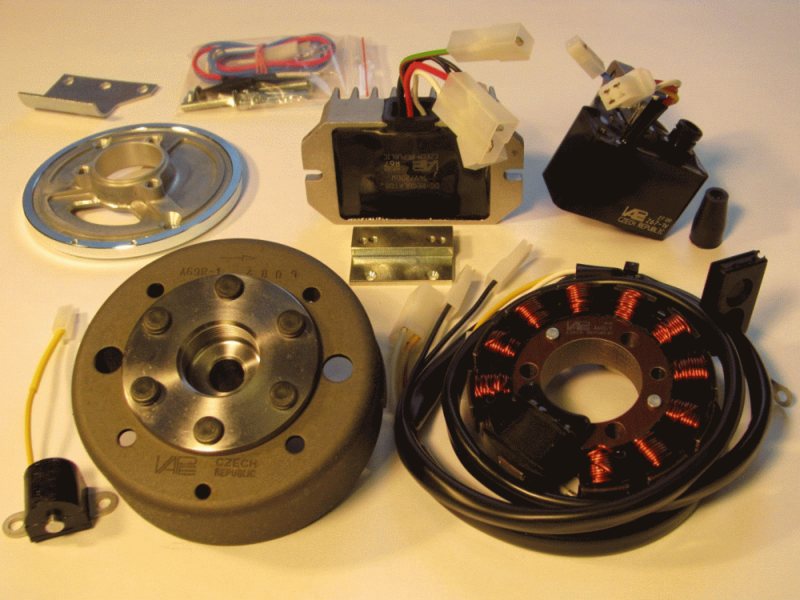 6V source and ignition kit for two-cylinder, two-stroke, clockwise engines. Lamp power 100W. Output at 2 spark plugs. Using the Jawa 350, type kývačka, Panelka or to other less common double cylinder types, including engines CZ, which are fitted with 6V dynamo PAL.